If Iraq war spending helped plunge the U.S. economy into its worst slump since the Depression, what does President Obama think his escalation of the Afghan war will do it? 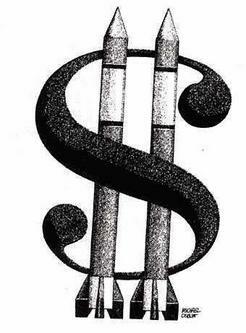 “The money spent on Iraq could have been spent on schools, roads, or research. These investments yield high returns. It could also have been spent more productively within the Department of Veterans Affairs, in its teaching and research programs, or in expanding medical facilities such as mental health clinics… Expenditures on the Iraq war have no benefits of this kind.” And by fiscal year 2010, the Center For Defense Information reports, the cost of the Afghan fighting will total $739 billion on the cost of Iraq fighting $2.337 trillion. Imagine the good those dollars would have done spent at home!